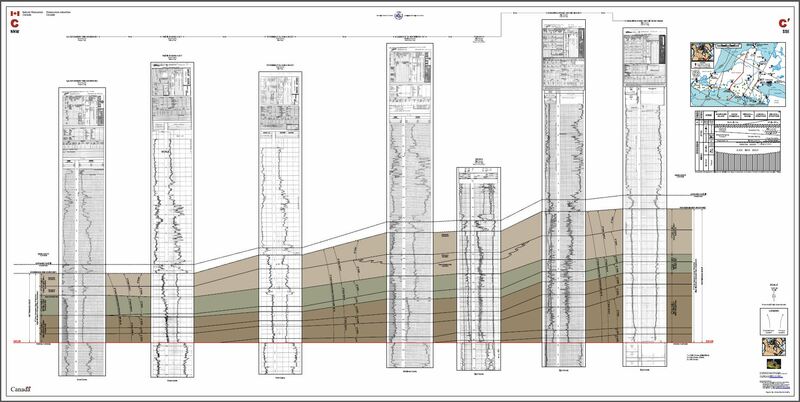 Upper Ordovician strata of southwestern Ontario are exposed throughout the lower part of the famous Niagara Escarpment, and are present in hundreds of drill holes but have received little modern stratigraphic analysis on a regional scale, even though they have been known for 150 years. Consequently, there is little regionally-applicable subdivision, subsurface mapping, or appreciation of the scientific possibilities and economic potential of these rocks. Regional stratigraphic analysis of integrated surface and subsurface data from Upper Ordovician strata of southwestern Ontario indicates the unit represents a third-order, northwestward-thinning, generally progradational system that advanced several hundred kilometres into the subsiding Taconian marine foreland basin over about 15 million years of Late Ordovician time. Coincidentally, the Late Ordovician was a time of intense, but short-lived, glacial paleoclimate, and this also contributed to the remarkable stratigraphic/sedimentologic characteristics of the strata. The dormant term, Nottawasaga Group, is herein provisionally resurrected to represent this third-order system, and is revised and extended to now include the Blue Mountain, Georgian Bay and Queenston formations. Blue Mountain facies are dominated by marine, organic-rich mudstone, Georgian Bay facies by shallow marine, thinly interbedded mudstone and calcarenite/siltstone, and Queenston facies by shallow marine, thinly interbedded siltstone and sandstone in the lower part, shoreline-related thicker sandstone in the middle part and nonmarine, massive red siltstone in the upper part. The Nottawasaga Group overlies the black, organic-rich calcareous mudstones of the Middle Ordovician Collingwood Member (Lindsay Formation, Trenton Group), and the contact between them is represented by a surface of condensed deposition. 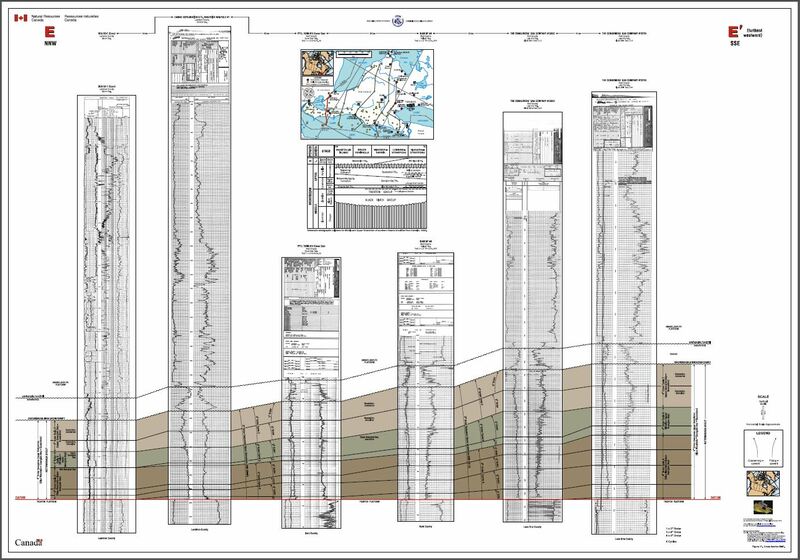 The upper boundary of the Nottawasaga Group is here formally revised to coincide with the major regional unconformity present between Upper Ordovician strata of the Queenston Formation and Lower Silurian strata of the Whirlpool and Manitoulin formations (Medina Group). Together, the Collingwood-Blue Mountain-Georgian Bay-Queenston assemblage is interpreted to represent a third-order, transgressive-regressive sequence of regional extent. The Collingwood Member represents the third-order transgressive systems tract, the contact between the Collingwood Member and the Blue Mountain Formation represents the approximate maximum flooding surface, and the Nottawasaga Group strata represent the complex third-order marine regressive systems tract. 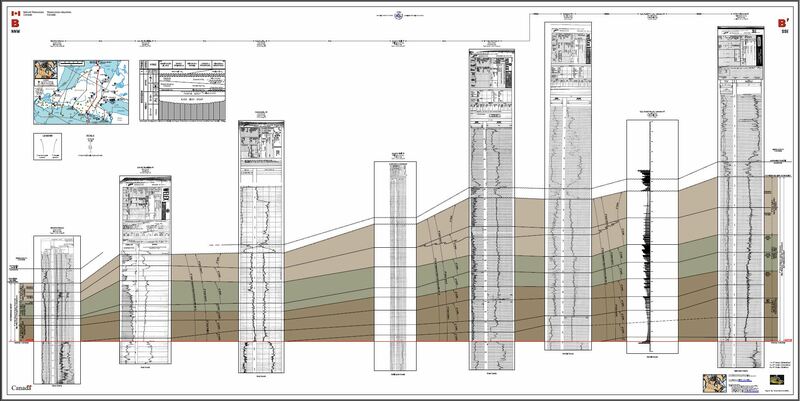 The subaerial unconformity at the top of the Queenston represents the maximum regression surface. This unconformable top of the sequence is marked by deep desiccation cracks and diagenetic alteration, suggesting a significant hiatus. In addition, these strata are clearly subdivisible into 3 previously-unrecognized, fourth-order, primarily regressive units that extend toward the northwest into the distal Taconian foreland basin. 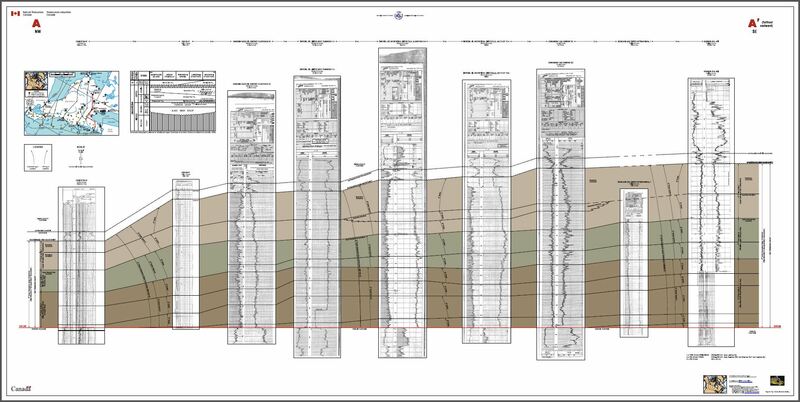 In ascending order, these new informal units are here referred to as Cycles A, B and C, and are characterized by thinly interbedded mudstone, siltstone, calcarenite and sandstone, primarily expressed as coarsening-upward regressive portions of the cycles. These are recognizable in outcrops, cores and subsurface downhole logs. The three informal cycles represent a stacked set of asymmetrical, shallowing-upward, fourth-order regressive cycles of regional extent, which collectively form the third-order Nottawasaga sequence. The locus of shallow marine coarser deposition shifted northwestward (basinward) through time, denoting an overall regressive trend. Recorded paleoflow indicators suggest the direction of general sediment dispersal was toward the WNW. Specific paleocurrent data indicate paleoflow was toward 305° in Blue Mountain strata, 320° in Georgian Bay strata, and 290° in Queenston strata. The fourth-order regressive cycles (A, B, C) each represent an asymmetrical, primarily regressive, sequence of regional extent, and each represents facies with less marine influence than the previous cycles. Cycle A includes marine strata of the Blue Mountain and lower Georgian Bay formations, Cycle B includes shallow marine to shoreline strata of the middle and upper Georgian Bay Formation, and Cycle C is essentially equivalent to the shallow marine, shoreline and nonmarine strata of the Queenston Formation. In addition, nested within each fourth-order cycle is a series of thinner, asymmetrical, coarsening-upward, fifth-order, regressive subcycles that generally mimic the thinning and fining trends of the larger cycles. Both the third-order T-R sequence of the Lindsay-Collingwood-Blue Mountain-Georgian Bay-Queenston, and the contained fourth-order regressive cycles, are interpreted to be primarily the result of fundamental regional tectonic controls on subsidence and sediment supply. Toward the end of Nottawasaga (Queenston Formation) time, important climatically/glacially-influenced facies were deposited. The uppermost Milton Member of the Queenston Formation, which comprises a thick, laterally-continuous blanket of nonmarine, brick-red, uniform, well-sorted, massive siltstone with poorly developed vertisol and calcisol horizons, recently has been newly interpreted to represent glacially associated, ancient terrestrial loessite deposits. The Nottawasaga Group contains potential for significant, and under-appreciated, shale gas, groundwater and industrial mineral resources. In particular, the Collingwood-Blue Mountain succession includes a modest thickness of black to dark grey shales, with coarser beds, which have good to excellent organic-rich source rock intervals (Type II organics), and which are thermally immature to mature. The hydrocarbon potential of these strata is strong and it is likely that there is a shale gas play of some type present. These strata form part of the vast Upper Ordovician shale-dominated succession of the Appalachian Basin (which has emerged as an important shale gas province in North America), and could provide a large, but as yet unevaluated, resource. In addition, this thick, shale-dominated succession could provide a competent seal for low-level toxic waste disposal in subsurface geological repositories in the underlying Trenton limestones, such as the Deep Geological Repository proposed for the Bruce Nuclear Site. More focussed exploration efforts resulting from application of the regional framework depicted in this study may increase the economic and environmental benefits derived from these strata. 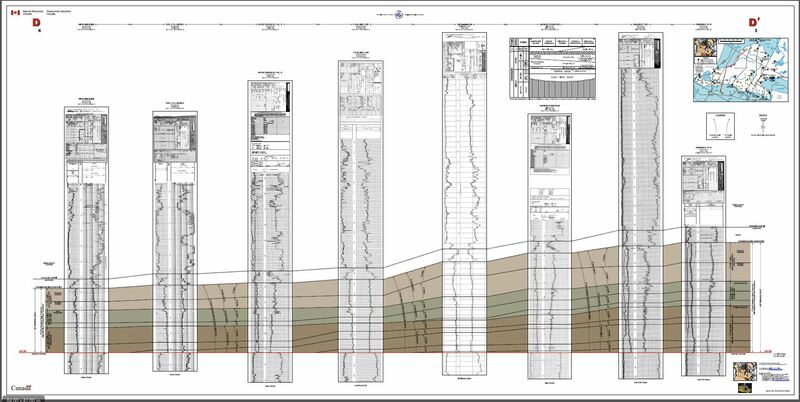 Upper Ordovician shales in southern Ontario have received little modern geological study. This study revises the older term Nottawasaga group to include the Blue Mountain, Georgian Bay and Queenston formations as a coherent, related set of strata. In addition, the strata can be divided into 3 previously-unrecognized depositional sequences, which provides a more predictive organization to the rock units. The shale-dominated Nottawasaga Group has potential for future shale gas, groundwater and industrial mineral resources, and also may provide a competent seal for future waste disposal in subsurface deep geological repositories.